The deep veins in the legs have valves to ensure the one-way flow of blood back to the heart. In the case of varicose veins, the valves in the deep veins are defective, allowing pooling of blood in the lower leg veins. Once these veins become distended, communicator veins open up, allowing the blood to drain into the superficial veins, resulting in a visible distended twisted veins in the calves and thighs. Symptoms associated with varicose veins are swelling, aching and cramping in the legs. If left untreated, this can proceed to skin discolouration, itching, varicose eczema and ulceration. Occasionally the veins will become inflamed, leading to thrombophlebitis. 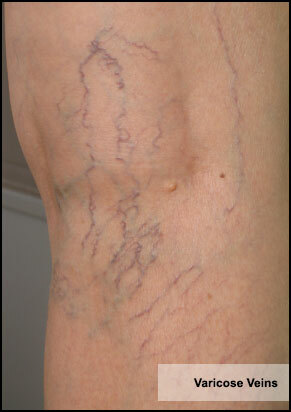 Small thin dilated veins lying close to the surface of the skin, visible as red or purple vessels. The common underlying factors are genetics, hormonal factors, pregnancy, weight gain and prolonged sitting or standing. They are more commonly seen in women and can also cause significant discomfort, with prolonged standing. Occasionally, spider veins may feed off larger incompetent veins (with defective valves), the initial assessment of spider veins will include a Doppler examination of the larger leg veins in the groin, to detect reflux or run-off from deeper veins. The treatment of varicose veins ranges from Sclerotherapy (injections), Laser treatments (endovenous ablation) to Surgical Stripping of the veins. Depending on the diameter, depth and extent of the defective veins and the presence or absence of reflux from deep veins. Superficial spider veins are cosmetically displeasing and are commonly eliminated via Sclerotherapy. The provincial health plan (MCP) does not cover cosmetic vein treatments. Involves the injection of a mildly irritating agent, commonly Sodium into the vein, causing swelling of the lining of the dilated vein. The vein collapses, disappears and is eventually resorbed by the body, relieving associated symptoms. A small gauge needle is used to inject the sclerosant; the level of discomfort of the procedure being equivalent to an ant bite. Following the injection, the spider vein is compressed by a dressing and the leg supported by a compression stocking. This is an important step to ensure closure and disappearance of the vein. Exercise such as walking 20-30 mins a day is encouraged to facilitate healing. Some results may be seen immediately following sclerotherapy, however, most often results will show in a few weeks, with some veins may requiring a second treatment. Temporary tenderness to the touch with a mildly uncomfortable sensation along the vein route. Transient Hyperpigmentation, 10-20% of patients may see some light brown streaks in the treated area, which fades within weeks to a month (this may be exacerbated by sun tanning in the post-treatment phase). Skin Ulceration, a very rare complication in which a blister may form, open and become ulcerated; healing will occur slowly, and a small scar may remain if this happens. Deep Venous Thrombosis is an extremely rare complication of sclerotherapy, especially if the veins treated are very small and superficial. It is more likely to be associated with deep ultrasound guided injection of larger, deeper veins as opposed to superficial spider veins. Allergic Reaction to the sclerosant.